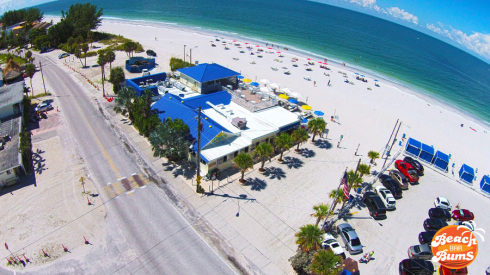 The title of Florida’s longest running beach bar may soon be exchanging hands as Caddy’s on the Beach, located on Sunset Beach in Treasure Island, Florida, nears a conclusion to its long running battle with the state of Florida over who actually owns the beach Caddy’s sits on. In a dispute that’s been ongoing for the last 10 years, the state may have finally reached a point where they’re willing to buy the property just to settle the case. According to The St. Petersburg Tribune, just last month “officials at the city of Treasure Island and Pinellas County got a letter asking if either government would object to such a sale.” The proposal would have the state purchase the land, tear the building down and then hand over the lot to the city to develop as a park. Local officials voted unanimously not to object to the sale. You can read the rest of the story here. What do you think of the possibility of Caddy’s being demolished and replaced by a park? Is it a good thing? Would you miss it? Let me know in the comments and if you stop by, make sure to snap some pics of it just in case! Image provided by Clear Vision Media. Be sure to give them a “Like” on Facebook to follow all of the work they’re doing in the St. Pete Beach area. What a shame !!! I never got to visit Caddy’s but it looks awesome.